Honestly, I can't imagine being any happier with a compressor. Was it expensive? Extremely. Is it huge? Gargantuan. Was it worth it? Without a doubt. I've never been a "compressor guy", but for someone who's not into them, I've tried several (Analog.Man, BJFe, Effectrode, Boss, MXR, etc.) and this thing beats them all, hands down. Compressors are inherently meant to "squish" and as silly as it sounds, I never liked that characteristic, instead trying to use them as a tone enhancer. All the others coloured my core tone in very unfavourable ways (especially the Effectrode PC-2A, I'm guessing due to the tube)- the Cali76 doesn't colour your tone whatsoever; only enhances it. Mine is the TX-LP version that offers the boost and dry blend controls, both of which have proven to be invaluable. The boost adds a fantastic harmonic complexity to any overdrive/distortion you stack it with that wasn't there before. The dry blend is amazing and allows me to dial in as much of my unaffected tone as I please, which has proven to really open the pedal up even more. This thing is, hands down, the finest compressor and tone shaper I've used to date. Highly recommended. I suspected as much. I stopped using Compressors for ages as the so called "classic" ones ruined my dynamics more than helping them. I ran cross the Wampler and that one changed my mind as the control over the compression circuit, a tone, and the all important "blend" which allows me to keep the main signal as the primary and have the slight compression mixed in. Marvelous transparent pedal for the $200 cost. I would love to have the Cali but man that is a chunk of change for me and none of my usual vendors has them for some simple payment options. I consider Cali76 and the SiideRig studio quality pedals and they cost a lot but seem to be worth it if you can budget it, I believe you sort of get what you pay for in this life. My simple yet effective setup. I also have a Digitech RP-350 that I use a bit. The Phaser is one of those movable pedals, like a Vibe. Sometimes I like mine before and after gains, either works, I have my board rigged for both. The Phase sweep reacts differently when it front and is somewhat diminished sweep quality. It is for sure not as articulate and note distinguishing. But before is also more EVH sound. Pedals function by an order of dominance, that which comes after will have the more dramatic effect on the tone. In front the distortion or drive stays more dominant, after one gets more phase sweep. Each might require a different tweaking to sound the best. If I want EVH type stuff it is in front if I want a more Pagey sounding phaser where the notes are heard it is after. Have to say most of time I like after, but I do have mine in front of my Dark Metal for different tones but it is after the Pinnacle for the best Pagey sounding tones. That requires some coordination. My feet are way too big for that setup. I'd step on all the pedals at once! Its actually set up so I have the option to do so. Sometimes Ill hit both tube screamers at once. But yeah Ive got size 13s. Takes a little time to adjust. I used to have a huge board with twentyish pedals and I've been reducing as my needs have changed. I know, very unslutty. If you can't tell, I am mostly into ambient guitar for now. The Behringer Slow Motion is good for cheating on volume swells. Dude just paste the URL of your pics in the yellow box IMG button. Sometimes cool to resize if possible. Have you tried the phase 90 before the TS and Muff? I prefer it before the OD/Distortion myself, as it sounds more part of the tone than sitting on top of it. lots of fun and I love it! Nice, you must know your way around the wood shop. Dig the corner work. So what are all the "jacks" on the side? Very pro level, as good or better than others I have seen for a bunch of bucks. You could sell these puppies for a chunk of change. I have no real wood working skills much less equipment to do cabinet like work. I manage to build my own boards with the size and tilt I like for next to nothing. I have a technique where I do not have to even make cuts just assemble and stain. Better, larger, exponentially less expensive than most metal frame jobs I see. No bells and whistles just functional. I have found using ebony stain works so much better than paint. Velcro comes off without taking off the stain like it does paint. I could never find a large enough board that was not way too expensive, I probably spent less than $40, made no cuts and presto huge board on a tilt w tons of room for expansion. If I can do this, anyone can. I am a terrible DIY guy, but manage to make my own boards, cables, and guitar wiring and really that is as far as I want to take it. The money I saved on making my own cables and boards is a small fortune, or a bunch of pedals I could not have afforded otherwise. The signal train is the holy grail of tone and what Ive found to be the key to a great pedal board and sound is the right boosters (Super Trem, Tone bone, Ep-pre) at intervals in the chain, create pure magic. A transparent o.d like a timmy and a good old dyna comp with two good boosters give you mojo on a stick, add a nice mxr carbon copy delay and a bit of spring theory reverb thrown in and you get into the S.R.V type of soundscape. Dude, that is freakin sweet. Now...do you play a white Paul custom? Curious anyone using the new GR55 guitar synth? Been studying up on this puppy what a mind blower, you cannot judge too much on various demos, especially the ones of chaps running through the factory settings, as we all know those are usually just this side of blow. The abilities of this unit exceed my wildest imagination. The ability to tune each string +/-8va auto tunings like DADGAD, 4 voices at once assigned to whatever strings, internal COSM effects and various models, there is so much inside this puppy must take a couple months to master it sufficiently. I had the earlier model and it was very cool indeed. I used to track massive choir voices against my heavy dist rhythms and cool strings under things. This one allows you to have a grand piano, mellotron like synth, and string ensemble, with the guitar voicing in DADGAD, like a huge all in one Kasmir like event. The tracking speed and glitch have been improved exponentially to anything previously, what a marvelous technological marvel. I cannot imagine the recording uses in the studio. 900 voices of various instruments. Have to up my amp system as I am giving this a split wired stereo 4x12 for the synth outs and my std guitar board and stereo twin 12s rig. I expect amazing things from this and it promises to completely change my entire manner and way of playing. Even if I manage to integrate as my main rig I learned my lesson about selling off pedals. Keep 'em on the reserve shelf to stock the studio room. I think I finally found the unit of my dreams and imagination. I need to get another cable so I can put my seiko sat100 tuner back on. it was where the smart gate is, but when I got that few days ago I took the tuner off. I'll probably put it above the boss dyna drive and plug it into the second out on the digitech death metal. Thats what I did that before with the digitech rp70. When I made this I didn't know that wahs are supposed to be at the front of the chain, so I'll probably make/buy a new board at some point, I'm running out of space anyway! You can actually put a tuner anywhere. As long as everything is off there is no problem. I have a Radial ABY switch that has a tuner out jack and that is an end of chain splitter box usually. I have mine first right now but I have it in numerous places, if a good tuner everything is fine. As long as you have at least one buffer in the chain the signal degrade will not effect the tuner. So you like the wah after the gains? I am a before chap myself as the signal stays up in level when the wah is engaged, after, sort of cuts your sound in the sweep but allowing for the general order of dominance in effects that which comes after is more present. I just consider a wah a filter and those always go more front for me. 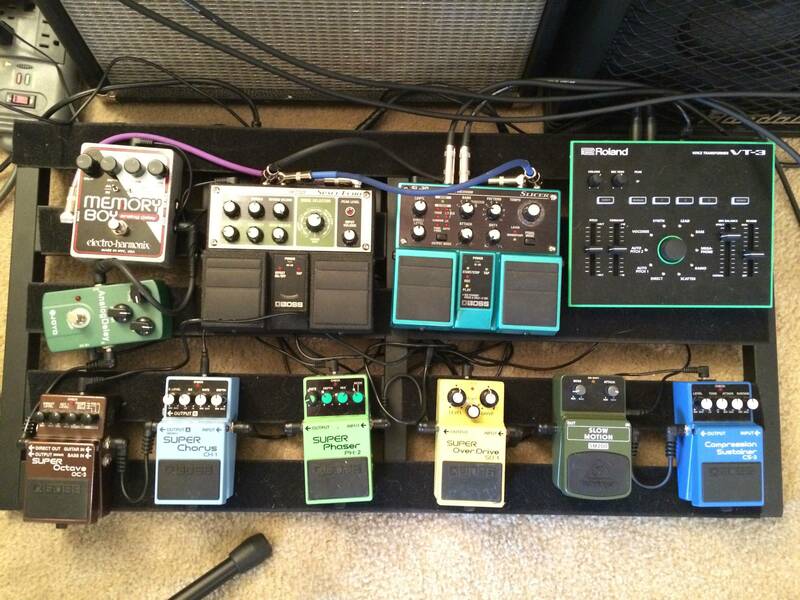 You can always put the wah at the side of the board for space issues. Pretty easy to make boards out of wood and save a fortune plus make any size or design you like. My last one is shown above. I am adding a GR55 synth on the board this week so I am glad I made the board so large. I recently got my Dunlop MXR ten band EQ, I was going to use it to put back the mids the Shin ei Companion fuzz takes out and the unit didn’t work, no lights nothing. I tried using a cheap alternate adaptor (chinese) and i fried the unit. Dunlop won’t respond to my emails so i guess I’m screwed on that, should have sent it straight back? So what happened wrong polarity on the pin? I learned sometime back to save all the packing materials and repackage as close to how it came when returning. Else they charge you a restock fee and they do not get proper credit from the maker. Returns go to who you bought it from not the manufacturer, call them for a return authorization number. Should be a an easy thing, happens all the time. I think you have 30 days on most stuff, I 'd send it back and just say it didn't work. Most new pedals have protection where a reverse polarity won't fry it, but too much voltage is a sure kill. What was the wart you used rated? That pedal is probably a 9v neg pin most likely <100mA draw. Power supplies are easy to match but if not a regulated decent supply the voltage will drift and not be constant. General rules are: 1.) Voltage must match, supplying more than the unit is designed is a fry. 2.) Current draw mA rule is you can have more, but not less, than the pedal uses. 3.) Polarity must match. I used a 18v adaptor as required but it was a cheapy from China. Wrong polarity I guess, very unpleasant smell. These things are not easy to fix since they were made by a robot. That MXR EQ is an 18v, really? I would have never guessed. Yep reverse polarity on 18, not cool. I see it comes with its own wart new, a good thing for sure. Those are only like $100 so no major loss. Live and learn. They will know right off what fried it so no warranty return on that puppy. Power requirements are often overlooked or everyone does that daisy chain thing which is a recipe for noise or mismatched params. I use the trusty VoodooLabs or special high voltage/current warts on a power strip feed off the Furman master power block. Well worth the one time expense of setting up a good power supply rig. Less propensity for noise and pedal death. My latest config with new GR-55 Guitar Synth. It's a dual rig for the std guitar pedalboard and the synth rig. I do not run the synth into my guitar chain. Pedalboard begins with a gold model Pitch Black tuner, Wampler Compressor, Voodoo Lab Giggity, Digitech Whammy V, Fulltone MDV3 Deja Vibe, Fulltone Clyde Deluxe, Egnater Goldsmith boost/overdrive, Egnater Silvermith boost/distortion, Wampler Pinnacle Deluxe, MXR EVH Phase 90, Egnater DarkMetal, into rack unit. Stereo loop is a tc electronic X4 delay, into a stereo Digitech Supernatural Reverb.